These delicious meatballs in a tangy, spicy vegetable stew are easy, healthy, and easy to make. You can make them with ground beef or turkey or chicken. They are even better the next day, after the flavors really develop. Serve with couscous and the carrot salad featured in my Middle Eastern Menu and repeated below. This recipe serves 3-4, but it multiplies easily and is great for a crowd. Line a baking sheet with parchment paper or foil, pour on about a tablespoon of oil. In a medium bowl mix above ingredients, kneading with your hands or a fork until well blended. Using about 1 Tbls. of mixture, form into meatballs. Put the meatballs onto the baking sheet, rolling slightly in the oil. Broil, turning once or twice until slightly brown, about 15 minutes. (If you prefer, you can brown the meatballs in a frying pan in a bit of olive oil). Remove the meatballs to a plate. Reserve. Heat oil in a frying pan or skillet, add onions, carrots, and garlic, and cook, stirring until onions are lightly brown and carrots soften. Add tomatoes, parsley, lemon juice, and spices. Simmer uncovered, stirring often about 15 minutes. 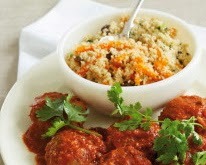 Serve hot with cooked whole wheat couscous or Israeli couscous.